Children up through age 5 can vote for this year’s Firefly Award, which is sponsored by the Indiana Center for the Book. The Ossian Branch has a copy of the 5 nominees that does not loan so parents can share the books with their preschoolers in the library. 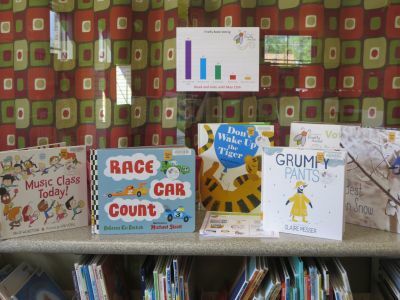 The nominees are: “Best in Snow” by April Pulley Sayre; “Don’t Wake Up the Tiger” by Britta Teckentrup; “Grumpy Pants” by Claire Messer; “Music Class Today!” by David Weinstone; and “Race Car Count” by Rebecca Kai Dotlich. After listening to the books, children can vote for the one they like best by circling a picture of the cover on a ballot. Both Bluffton and Ossian have “Grab, Checkout & Go” bags, which contains the books and ballots. These bags loan for 3 weeks. Voting continues until May 15th. This state award is administered by the Indiana Early Literacy Firefly Committee made up of professionals in Indiana including teachers, librarians, caregivers, and project coordinators; all of whom are involved in early childhood development. The award was first given in 2015. Picture books serve an important role in the first years of the life of a child. The purpose of this award is to encourage parents, caregivers, and very young children to interact together with exceptional picture books.